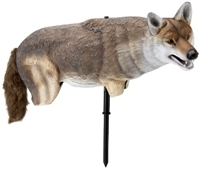 Life-sized, lightweight coyote decoy works great for scaring nuisance birds such as geese. Can also be used with any of our predator calls. Gives the coyote a sense of “ease” seeing another coyote when coming in to a call. Single stake allows for easy and quick set up. Decoy will rotate on stake with the wind and free moving furry tail adds lifelike realism. Life-sized, lightweight coyote decoy. Works great with any of our predator calls. Gives the coyote a sense of “ease” seeing another coyote when coming in to a call. Single stake allows for easy and quick set up. Decoy will rotate on stake with the wind and free moving furry tail adds lifelike realism.